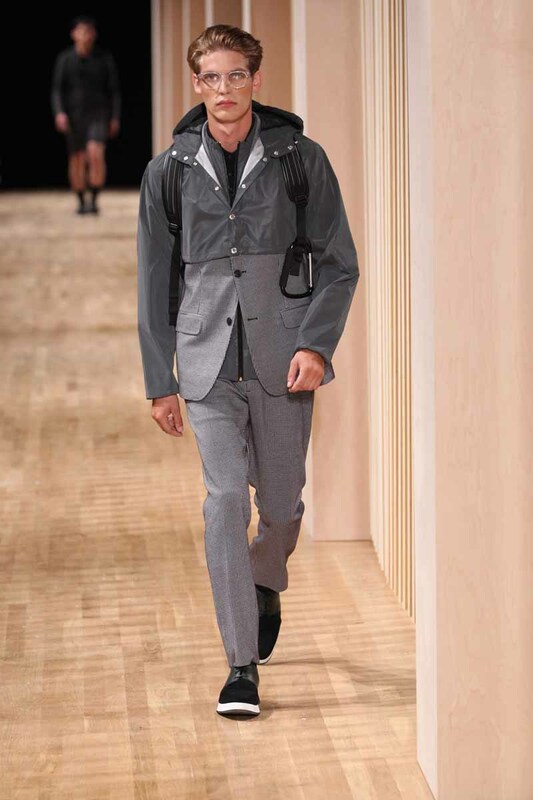 NEW YORK, Sep 4, 2014/ — Earlier tonight, newly installed Perry Ellis Creative Director Michael Maccari debuted on the New York catwalk with a Spring 2015 collection that took a new look at seasonless dressing and layering. Inspired by his environment – NYC’s architectural grids and linear elements – along with the work of artist Sean Scully and his repetitive stripe sequences and bold color, Maccari advances the American icon, and the brand’s main collection with a sophisticated play of fabrics, color, pattern and layers. Unexpected fabrics and bold, playful patterns cue a new “uniform” and introduce a new take on wear-to-work wear. Performance textiles dressed up and alternatively refined dress fabrics were shown in active silhouettes. In a nod to the brand’s namesake, unexpected patterns, black-and-white graphics, tonal checker-boards and bold striping will punctuate the collection. In this newest offering from Perry Ellis, Maccari introduces athletic layers, fresh details and a glazed, modern palette to create an honest approach to blending active and sportswear. For his debut collection for Perry Ellis, Michael Maccari advances the American icon, and the brand’s main collection with a sophisticated play of fabrics, color, pattern and layers.